Enigma wrote: wow cairns- this is beautiful. the colours are gorgeous, the pathways are so much clearer, and the touch of continent colour in the underworld is absolutely brilliant. (im not sure whos idea that was, but im not really interested in going back and reading 2 months worth of posts ). as for comments, i have to agree with keygoi about the font being a bit pixely- especially in the legend, but also throughout the map and in your (and highc540's) sig. 2nd, there is a dark line dividing each amente from its paired afterlife. these lines look like they could almost make a circle if connected, but it seems that they would not quite match up. i think the map would look better if these lines were based around a perfect circle as this is the focal point of the map. [also note that on maat this line does not connect all the way to the upper edge of the "cloud"]. other than that i cant see any tweaks . this map is really shaping up wonderfully and it looks like it will be a lot of fun to play . Enigma...thanks for the comments. Lovely to have you back at the end of this map. * I've attended to those circular line...these should be far better now. * I've adjusted all the headings in the legend....there is still some small pixelation happening there from the font type, but I think this is much better than it was. Underworld A's Amente circle doesn't quite touch border to border, as Enigma pointed out. AndyDufresne wrote: Underworld A's Amente circle doesn't quite touch border to border, as Enigma pointed out. Can you do a browser refresh please. 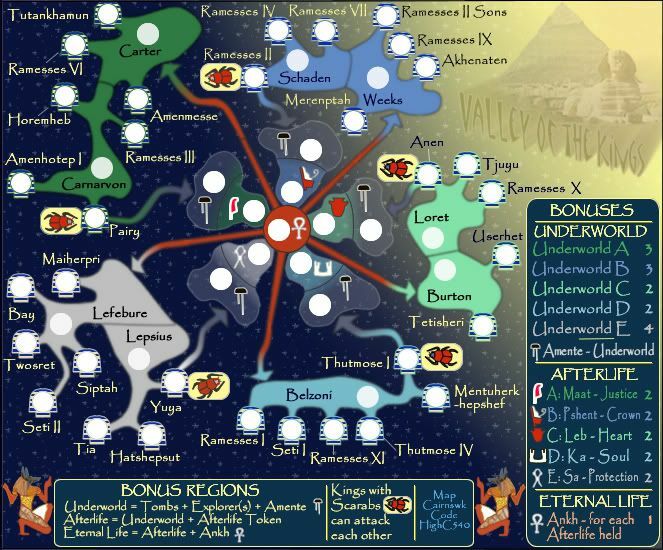 50 updates of the map, and nobody has told you yet that there are no pyramids or sphinxes in the Valley of the Kings? In fact, the earliest tombs in the Valley were build some 1000 years after Cheop's pyramid, some 600 kms further up the Nile. jasnostj wrote: 50 updates of the map, and nobody has told you yet that there are no pyramids or sphinxes in the Valley of the Kings? In fact, the earliest tombs in the Valley were build some 1000 years after Cheop's pyramid, some 600 kms further up the Nile. That topic has been well discussed in this thread. I am well aware of the fact that there are no pyramids in the Valley of Kings. 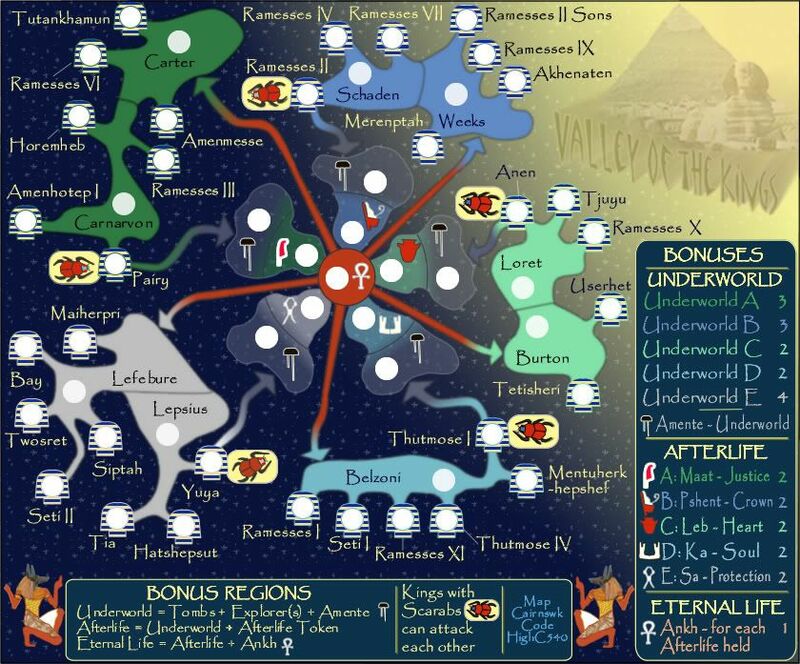 The Sphinx and the Pyramid have a link to the afterlife which is what this map is all about. They are also one of the most recognised symbols on earth. That is why they have been used here. lol cairns- your's are the only maps on which i always have to refresh again after getting to the correct page. so andy, dont feel bad, i almost said exactly the same thing again . these corrections look much better. however i still dont think those lines form a perfect circle... X|. if you dont think this needs to be pressed dont worry about it, but if you want to fix it, it might help to make a perfect circle 1st, and then overlay it onto the map, and then erase the part where it shouldnt show. also, to be really nitpicky, the line you extended in underworld A now goes about a pixel too far, lol. Do you need an excuse to have a war? I mean, who for? Can't you just say "You got lots of cash and land, but I've got a big sword, so divy up right now, chop chop." thanks enigma...i did the circle thing underneath. I think it if is now fine, and i am happier with it than i was. as for the pixel too far....i'll get over it if you will. As for the refreshing, at the end of the process enigma, i don't beleive in putting up new versions simply for one or two small changes. Thanks unriggable...is this the new version of QUENCH....as FOUNDARY was my new version of FOUNDRY? Cairnswk, there seems to be some problem with the XML link. Can you look into it? AndyDufresne wrote: Cairnswk, there seems to be some problem with the XML link. Can you look into it? The Final Forge period has concluded for the Egypt: Valley of the Kings Map. All objections have had their time. The Foundry and I hereby brand this map with the Foundry Brand. Let it be known that this map is now ready for live play (barring any Lack vetoes). Congrats!!! Yay!!! Maps still get quenched around here! Woo!!! Such a... I'm tearing up, but it's happy crying. WidowMakers wrote: Congratz. Keep it up. Last edited by cairnswk on Wed Aug 01, 2007 5:32 am, edited 1 time in total. Out of curiousity - who is the most published map maker? I guess WM at the mo?! I really only have 3. I don't count the two revamps as maps I have published. I just edited them. Revamps are not as hard (IMHO) because you can ignore gameplay and just focus on graphics. Plus Jota has 5 right now too and he has no revamps. Congratulations with this new map. Just checked the XML to make sure and didn't find any mistakes (like there were at the last new maps), so I will start a few games in a moment. Always nice to have a new map. Yeti_c...there is no race nor honour for me so please I am not in the race to be most published. I have creative energy at the moment and that is a driving force behind these maps. To be honest, I really don't care who is most published. As long as players enjoy the maps and it provides entertainment for them on this site. Forza AZ wrote: Congratulations with this new map. Just checked the XML to make sure and didn't find any mistakes (like there were at the last new maps), so I will start a few games in a moment. Always nice to have a new map. Forza AZ...that's very nice to know, thank you for checking. Remind me to recommend you for xml volunteering when the prep checks are instigated. Another map of cairns dynasty move forward in conquer club. gimil wrote: Another map of cairns dynasty move forward in conquer club. Thanks gimil...however, from reading the play feedback, this is not a map that everyone understands. I think there will be a few changes made from what I am reading.